Saturday, the Trojans had the opportunity to show off in front of a crowded Cromwell field in the annual spring game showcase. There were plenty of positives from the game overall with big plays from the offense and defense. Four different quarterbacks and a variation of offenses gave USC fans a chance to see the products of spring practice. With both projected starting offensive tackles out, Frank Martin and Liam Jimmons went with the first unit at left and right tackle. Different offenses switched in and out and the quarterbacks rotated in the order of: Matt Fink, Jack Sears, JT Daniels, and Kedon Slovis. It’s important to note that the offensive units and their respective quarterbacks were not an indication of who will start in the Fall. The day started off with position groups running individual drills, starting with kickoffs (no actual kickoffs took place, instead a machine shot the ball to the goal line). The game kicked off around 11:30 am on Cromwell field and the PAC-12 network. JT Daniels led the third rotational offense down the field with quickness and tenacity. Daniels showed out at the right time as he looked as good or better than he has during what has been a very good spring for him, throwing with both precision and a faster release. He connected with Michael Pittman twice on both a post route and a comeback route, which went for first downs. He continued his excellent passing with a 15-yard connection to Tyler Vaughs. Overall, Daniels had a very strong day. Fink had an excellent day as well, and got the Trojans off to a nice start as he launched the ball to Amon-Ra St. Brown for a huge gain down the field. The offense routinely lined up in two back sets for the day, most of the time one running back flared out wide for an extra dump off option in case the QB faced pressure. In one instance, Fink faced enormous pressure and threw a short pass to Quincy Jountti down the middle, who took off in what wound up looking like a trick play, for 30 yards and a touchdown. Fink also recovered a fumble and ran for some yardage after his center snapped a ball well over his head. Stephen Carr lined up with Quincy Jountti in the backfield, and the first play of the series featured Carr up the middle for 3 to 4 yards as he was hit hard by linebacker Palaie Gaoteote. Carr was routinely stunned at the line in the first series, but gained momentum as the day went on. Sears faced some difficulty early on leading the twos, but his tenacity to finish strong exemplifies the type of leader he truly is. On his first series, Sears threw to an open Devon Williams, who had the ball stripped away by cornerback Dominic Davis for a defensive touchdown. The second series saw more offensive struggles as the defense got good pressure up the middle and forced Sears to throw quickly. This throw ended up in a one-handed interception by true freshman Drake Jackson, who returned the ball for a touchdown. Sears’s third series saw some different outcomes however, as he turned on the jets for 8 and 15-yard runs down the field, then delivered several nice passes to Vaughns and Williams to put his offense in the redzoen. Sears came all the way back from that interception to eventually hit John Jackson III for a touchdown. Slovis saw some action as well, as he was the last of the bunch to rotate in at the position. Slovis certainly doesn’t look like a true freshman, the way he’s been playing. Coming from Kurt Warner’s system, Slovis delivers the ball fast and accurately while sitting in the pocket. Slovis connected with Erik Krommenhoek and Vaughns for nice gains while hitting Carr for a nice first down on a third and long. Markese Stepp showed up yet again, hitting a 55-yard run for a touchdown up the right side of the field. Stepp has preformed tremendously well during camp and he showcased some of his skills during this spring showcase. Stepp’s touchdown seemed to spark some enthusiasm for Carr as well, as on the next play Carr took the ball some 35 yards down the middle of the defense. The defense had an overall good day as several virtual sacks were recorded as John Houston and Drake Jackson recorded one on both Sears and Fink respectively, early on. Jackson seemed to highlight the day for the defense, as he has brought a real presence to that defensive line. The cornerbacks looked good, which may be a testament to coach Burns style of teaching and leadership. The depth in the backfield may be a primary concern heading into the season, however. Jalen McKenzie suffered a hyperextended elbow during Thursday’s practice and the coaches elected to hold him out today. Head coach Clay Helton said he believes he will be back next week. Austin Jackson and Bernard Schirmer have both missed time recently. Helton said Jackson was at a family engagement and will be back next week. He said Schirmer has a “personal thing” and will be back late next week. Fellow offensive tackles Clayton Bradley is dealing with a back injury. 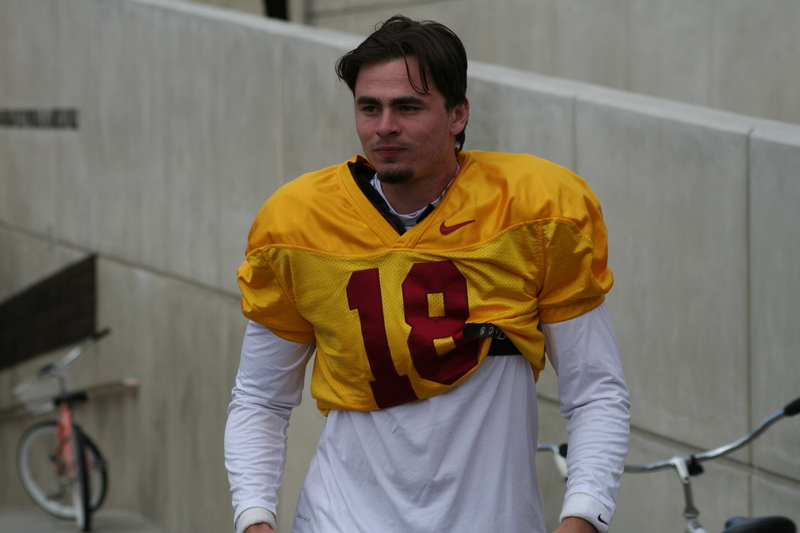 Helton said they hope to have him back by fall camp. Josh Falo is still missing time due to an AC sprain in his shoulder. Jude Wolfe will likely be held out the rest of spring with a back issue. Solomon Tuliaupupu went four practices this spring before a decision was made to shut him down when he foot was sore. Helton said this was an overprotective decision, as they want him ready for call camp.